Luis and his old chair. It’s Baby Bear’s first day of school and he’s very excited! 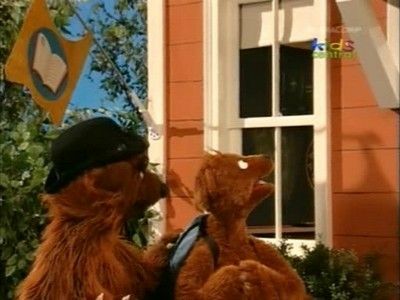 Papa Bear drops Baby Bear off at the Storybook Community School and tells him that he loves him and will be back after school to pick him up. At school, Baby Bear meets and becomes friends with Hansel and Gretel, Jack and Jill, Little Red Riding Hood, and other storybook characters. While Baby Bear is having fun making friends and learning new things, he often misses his family throughout the day. Baby Bear wonders what they are doing and wishes that they could be there to share in the excitement of his first day in school. When Papa Bear picks Baby Bear up, Baby Bear tells him that while he had a great time at school, he also really missed his family. Papa Bear reassures Baby Bear by telling him that it’s okay to miss the family. He tells Baby Bear to just think about the time they get to see each other again at the end of the day, and how he will tell his family about all the great things he did in school! Abby is preparing to ride her very first tricycle! She has her basket, helmet, and her friend Elmo, but Abby doesn’t know how to ride a tricycle. 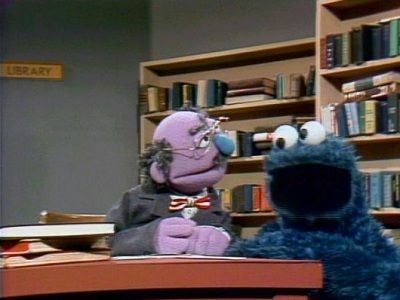 Elmo suggests that Gordon teach Abby since Gordon was the one to teach him. Gordon teaches Abby about all the different parts of a tricycle; the seat, handlebars, and pedals. Abby has trouble at first. She sits on the bike the wrong way. She also becomes frustrated riding her tricycle and thinks she needs magic to push the pedals. With hard work and practice, though, Abby learns to ride without help from Gordon. Whee! 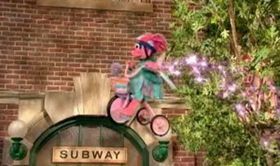 Abby becomes so excited that her wings start flapping, and her tricycle lifts off! Abby swoops back down to get Elmo and they both ride off together into the sky, singing on their tricycles. Rudy pretends to be a space alien; when his spaceship won't start, Abby and Elmo play mechanics and fix it. 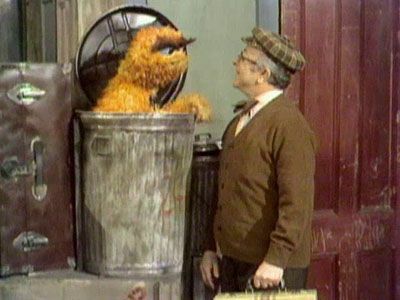 Big Bird and Snuffy are the hosts of "The Letter of the Day Show" on Sesame Street, and learn all about how the letter X can come at the end of a word. 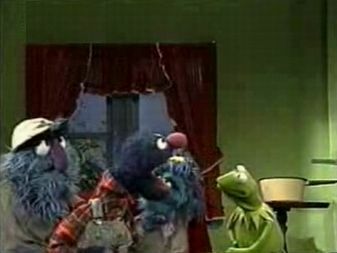 Today is the number seven day on Sesame Street! 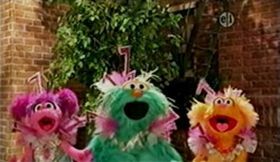 Rosita, Abby, and Zoe begin singing about the number seven as they count seven dancing chickens. Next, Maria does the number seven rumba. As the seven celebration continues, a sniffling letter “S” arrives. He is sad because he can’t think of anything to do to help celebrate the number seven. Abby and Zoe get an idea! What if the letter “S” finds seven words that begin with the letter “S?” Abby, Zoe, and the letter “S” search for seven “S” words, and then sing a song about the words. Afterward, Abby performs number seven magic. 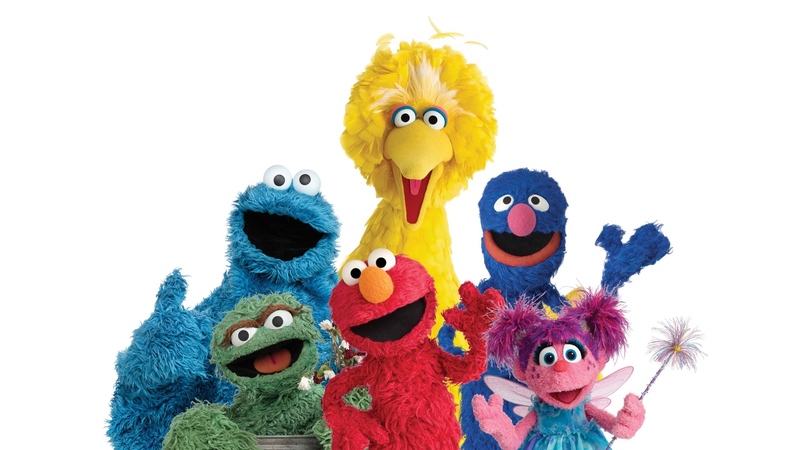 Abby makes the number seven rise out of Elmo’s hat, seven butterflies appear out of Elmo’s ear, and—oh no! Seven Elmos appear instead of seven pumpkins! Luckily, Abby turns seven Elmos back into one Elmo, and tries her magic trick again. She succeeds! Abby turns one pumpkin into seven pumpkins. Hooray! It is an amazingly, awesome, super terrific, seven celebration! Maria helps Elmo write a story about the letter “G.” Elmo is having trouble thinking of letter “G” words, but Maria reminds him of the letter “G” sound. Elmo thinks of the word “golf”. He draws a picture of himself playing miniature golf and hitting the ball so hard it flies into space and lands on Planet “G!” Elmo remembers another “G” word, “goldfish”, just like Dorothy, his pet fish! He draws a picture of himself riding on a goldfish up to the planet “G” to look for the golf ball. He tries to think of another “G” word when Baby Bear stops by before he leaves for school. Baby Bear loves his teacher, Mother Goose. 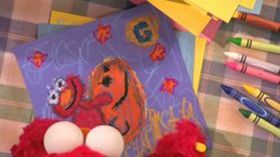 “Goose” begins with the letter “G!” Elmo incorporates a picture of a goose into his story. But uh-oh! The goose perches herself on Elmo’s golf ball, thinking it’s an egg. Elmo has to get the goose off the ball, but how will he do it? With the help of Zoe and her two friends who are “girls”, Elmo sings the “Get up and Go Dance” song. He draws a picture of the goose getting up and dancing with the two girls as he leaves the golf ball behind. All of a sudden, Elmo finds a hungry “goat” munching on a page of his story. When the goat stops eating, Elmo draws a picture of the goat trying to eat his golf ball in space. Luckily, in the story Elmo offers the goat some “goulash” and the goat drops the golf ball. He draws a picture of himself flying back to Sesame Street. Elmo excitedly reads the entire story of Elmo’s Adventure on the Planet G to Maria and Chris. Elmo and Abby are resting when suddenly it’s time to play the game show, “Find that Amphibian.” Elmo and Abby must find an amphibian before the game show’s tadpole turns into a frog. 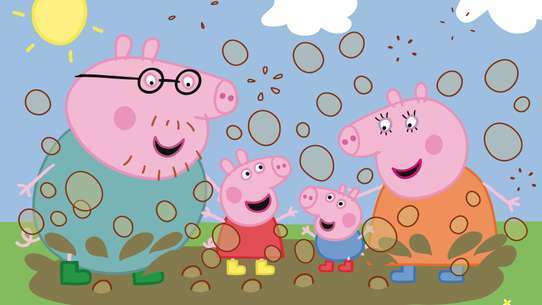 They don’t know what an amphibian is, but the announcer gives them a clue- an animal that starts out living in water. Elmo and Abby meet a fish and are convinced they have won the game! As the announcer explains, though, fish only live in water and not on land. 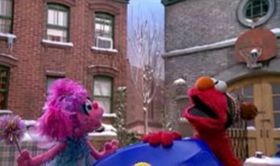 Elmo and Abby look for their second clue- an animal that breathes air. They find an amphibian! A bird! They learn, though, that amphibians don’t have any feathers. 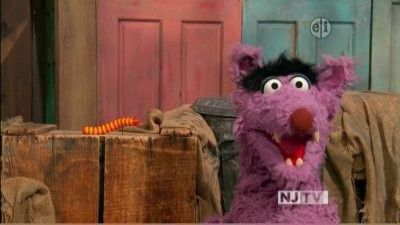 Elmo and Abby look for their third clue-an animal with four legs. Elmo and Abby come across a horse, but a horse is a mammal, not an amphibian. Elmo and Abby use their last clue about metamorphosis to help them. They come across an alligator. Could this be an amphibian? No, an alligator is a reptile not an amphibian. He looks the same way now as he did when he was a baby, only bigger. Elmo and Abby are disappointed. They’re never going to find an amphibian! 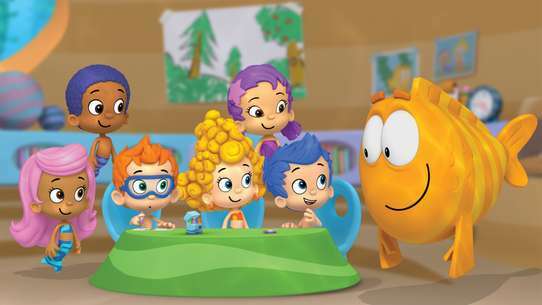 Luckily, they run into Chris who suggests that they find an animal that fits all the clues- an animal that lives in water when it’s a baby, breathes air as an adult, has four legs, and goes through metamorphosis. Suddenly, they think of Anne Phibian, the game show’s announcer. She matches all the clues. Hooray! They found an amphibian. And just in time! 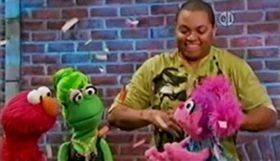 Elmo, Abby and Chris celebrate as they dance with the amphibians!